Brother Leven Harton, OSB, prays lectio divina in the church at St. Benedict’s Abbey in Atchison. “Lectio divina” is Latin for “divine reading.” It is an ancient form of praying and meditating on Scripture that is practiced by Benedictine monks, oblates and laypeople around the world. Advent starts on Sunday, Dec. 2. What better time than the beginning of the church year to bring the Lord into your life in an intimate new way? Come study with The Leaven at the feet of the masters — or at least some of the monks who still utilize St. Benedict’s practice of “lectio divina” almost 1500 years after his death. ATCHISON — It’s not news that St. Benedict’s Abbey here is a place of peace and prayer. Is it simply inherent to the monastery building? Or monastery life? Does it emerge effortlessly — and do you have to wear a black-hooded robe to possess it? It is a central prayer of Benedictine monasticism and is, fundamentally, an exercise in coming into contact with the divine through prayerful meditation on the word of God. Lectio enhances the liturgy, sacraments, one’s spiritual life and vice versa. “Lectio divina is, primarily, listening,” said Father Simon Baker, OSB. “It is listening for a way that God is speaking to you,” he added. But, what does God sound like? “Well, he sounds a lot like me to me,” said Father Simon. What? No voice from a burning bush? Or instructions from angels? All of us are familiar with Scripture. We hear it read aloud at every Sunday Mass and hopefully read it in our homes. So, at first glance, it seems like this first step shouldn’t be too hard. But Father Simon and other monks agreed that this is perhaps the most difficult step of lectio. “This is the danger of prayer,” said Father Meinrad. “You sit down to pray and, at once, you think of all the things you could be doing. Just “doing” it, he said, eventually catches you up in it. “I rarely find that once I get into good lectio that I don’t want to be there,” he said. The choice of Scripture passage is up to you, although passages from the Gospels are a great place to start. And there are aids available if you don’t want to go it alone: Try “Lectio Divina of the Gospels 2018-2019,” published by the U.S. Conference of Catholic Bishops, or something similar, if you’d like. Just don’t attempt to “complete” a certain section; this isn’t a school assignment. Instead, it’s a chance to let God lead you into a deeper appreciation of his word. The key to doing lectio well, say the monks, is to sit in silence, quiet the mind and read slowly. “You do lectio the way you drink a glass of fine wine,” said Father Marion Charboneau, OSB. The meditative step of lectio is simple, by comparison. These connections are vast and can vary from being reminded of a past experience to re-awakening forgotten desires. The point is to reflect on one’s life through the truth of the reading, looking for ways the reading connects to concrete events in one’s life. “Naturally, what will happen [after meditation] is things will be awakened in you which immediately lead you into prayer,” said Father Simon. The next stage, likewise, follows rather naturally. Contemplatio is an opportunity to sit awhile with whatever you’ve discovered from your reading and your prayer. But lectio need not be an entirely reflective exercise; one last step can serve as an action point. While the steps of lectio are now widely practiced, in St. Benedict’s day they didn’t exist. For him, the steps of lectio flowed naturally from his daily encounter with God in reading the Scriptures. It was not until centuries later that the steps were formed to help people navigate the Scriptures and their own lives better. The steps, like the reading of Scripture during lectio, are traditional and are guidelines rather than strict rules. In fact, lectio can be done in as many ways and contexts as friendships are expressed — because lectio is, ultimately, a conversation with a person: God. 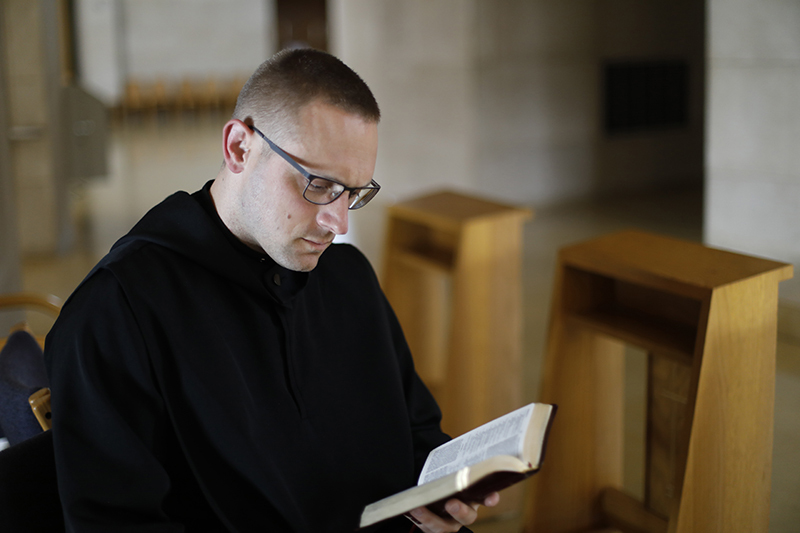 For Father Meinrad, lectio has helped him on his journey of recovery from alcoholism. He often integrates 12-step recovery literature with Scripture readings in his daily lectio. “I think St. Benedict’s thing was not to have an exercise in futility,” he said, “but [he] wanted something that was beneficial and was going to lead the person. Praying lectio can have therapeutic effects as well. While both spiritually and mentally therapeutic, lectio should not be reduced to just thinking positively. “If lectio is just you having good thoughts about a reading, that’s not lectio,” said Father Simon. Awareness that lectio is a conversation with the ever-present Holy Spirit is essential to the practice. “Then, we remember that lectio is not a burden, but something we are privileged to do,” said Father Meinrad. Any habit creates change — and doing lectio divina is no exception. “When I do lectio,” agreed Father Meinrad, “that inspires me to look at my life then go to Mass and confession because I know I need the Lord more. For Father Simon, it has been a lesson in the constancy of God’s love. “I used to think if I was behaving well, I was doing great and worthy of God’s love,” he said. “And if I wasn’t, then I was doing poorly and God wasn’t paying attention to me.